We were thrilled to be invited to The Manor for an open weekend. Organised by the lovely ladies at Marry Me in Somerset. The long private drive gave us a glimpse of The Manor on our approach, it soon became clear why people would choose The Manor for a wedding venue or private party, it is truely stunning! Parking next to the Aston Martin DB9 made Cedric feel right at home. After setting up we were given a full tour of The Manor and Lakehouse which is fantastic, the property is full of character and surrounded by well kept gardens and a swimming pool. 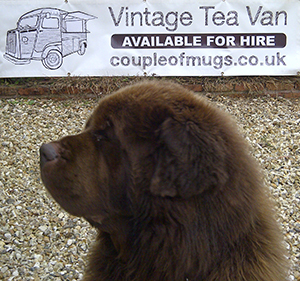 Being at the open weekend gave us the opportunity to promote ourselves beyond the simplistic Vintage Tea Van. For private events and weddings we offer a plethora of beverages including Champange, Pimms, Cocktails, G&T (see Jane & Ant’s Wedding) or even Jager Bombs (see Kayleigh & Stu’s Wedding). The tea is always part of our inventory for the non-drinkers and the drinker who might have drunk too much. 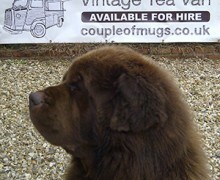 We met some great people through the Open Weekend, least of all Charlie Brown who became an honoury Mug for the day. Duties included posing for photographs, meeting and greeting customers and “tidying up” left over snacks. It was a pleasure to be at The Manor and we look forward to providing a variety of Vintage Van services throughout 2012. If you are interested in our services for your wedding or private party in 2012, get in touch!